(a) Show in a diagram how you will arrange the given items for the measurement of the frequency of the given AC source. (b) You are given that the frequency of vibration of the sonometer wire segment of length ℓ in the sth mode is (s/2ℓ)√(T/m) where T is the tension. (i) Now explain briefly how you will proceed to measure the frequency of the alternating current making use of the vibration of the sonometer wire segment in the fundamental mode. (ii) Write down the expression for the frequency of the wire. 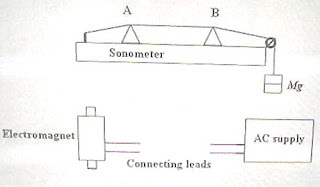 (ii) How is the frequency of AC related to the frequency of vibration of the sonometer wire? Justify your answer. (c) Your teacher now wants you to use a brass wire of linear density μ instead of the steel wire in the sonometer. Instead of the electromagnet she gives you a sufficiently strong permanent bar magnet. Show in a diagram how you will arrange the given items for the measurement of the frequency of the given AC source. (d) (i) Explain briefly how you will proceed to measure the frequency of the alternating current in this case. (ii) How is the frequency of AC related to the frequency of vibration of the sonometer wire in this case? Justify your answer. The above question carries 15 points. You have about 17 minutes for answering it. Try to answer the question. Certainly I’ll come back shortly with a model answer for your benefit.